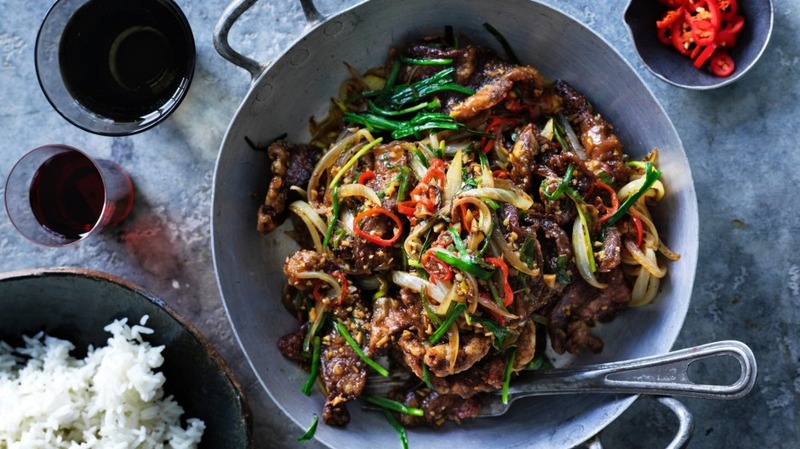 This classic stir-fry is elevated beyond the ordinary by the winning combination of cumin, chilli and onion – and those who like it hot can ramp up the spice level by adding a teaspoon of dried chilli flakes. The dish is a knockout served as part of a banquet, but it works equally well paired with a bowl of steamed rice as a quick but delicious midweek dinner for two. And, of course, you're free to replace the beef with lamb, pork, chicken or even slices of duck. Place the potato starch in a wide shallow bowl and season with salt and pepper. Place the beef strips into the bowl and coat with the seasoned potato starch. Heat the vegetable oil to 180°C in a wok, then fry the beef until browned and cooked to medium rare, about 2 minutes. Drain on paper towel. Pour the oil out of the wok (it can be strained and used again). Place the wok over high heat. When it is smoking, drizzle in the peanut oil and stir-fry the onion until it starts to soften. Add the garlic and ginger and stir-fry until fragrant, then add the cumin and chilli for a minute or so. Pour in the stock, soy sauce and vinegar, stirring to deglaze the wok, then simmer until reduced to a light consistency. Add the beef and garlic chives and cook for a further minute, just to warm the beef and wilt the herbs. Drizzle with chilli oil, spoon onto a plate and serve immediately.